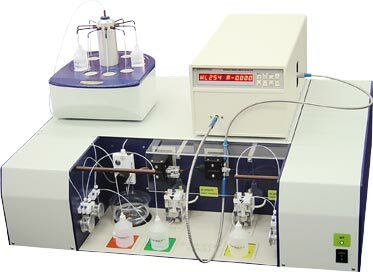 The device is designed for separations and analyses of ionic compounds (organic acids and bases, inorganic cations and anions, aminoacids, etc.). The device is fully automated isotachophoregraph controlled by the computer. The instrument is equipped with autosampler (10 positions), two contactless high-frequency conductivity detectors and UV-VIS detector (200 – 600 nm). IONOSEP 2002 is controlled by software package running on personal computer under Windows 9X/2000/NT/XP.The supplied software package enables monitoring of analysis, evaluating of analysis, printing of protocols and exporting data.